The newest trend in Progressive Lenses involves new production processes. The lenses are produced digitally, which gives the wearer high definition optics (like your television) to provide clarity and very wide fields of vision and reduced areas of peripheral distortion. This is a covered option on most vision insurance plans! We use the Visioffice Measuring System to allow us to utilize advanced measurements in our customized lenses. The Varilux S Series 4D fit is a new lens which uses NanOptix and Synchroneyes Technologies to give superior clarity and the widest field of view in the industry. In fact, there is no peripheral distortion in this lens. We're so sure you'll love it, we are offering a money back guarantee on this lens!! 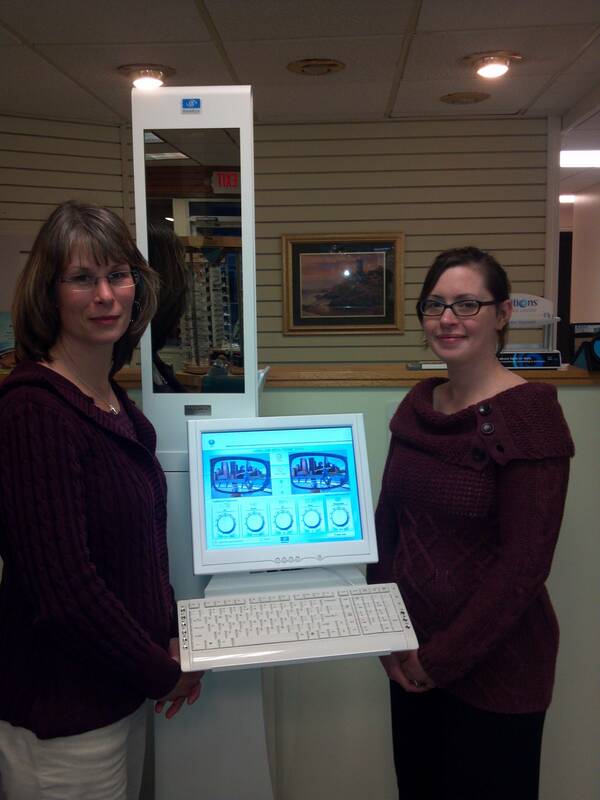 Here, our opticians Pamela Melendy and Gillian Dodge stand with the VisiOffice measuring system.